Throughout the summer months free cultural activities will be set up outdoors for the public to enjoy. 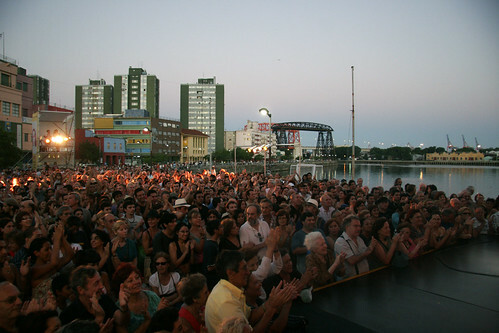 Outdoor film screenings of Argentine movies will be held on weekends at the Palermo rose gardens, Folklore concerts will be staged at the Anfiteatro Costa Sur in Puerto Madero, and The Anfiteatro Parque Centenario will be hosting theatre, film, music and poetry events, amongst many other outdoor venues in the city that will also be staging musicals and clown shows. For the closing of the event on the 18th of February, a milonga will be staged in front of Caminito in La Boca where Max Van De Voorde and Solange Acosta, winners of the 2011 Tango Championship, will show off their dancing skills. These free cultural events will be offered from the 14th of January-18th of February so if you’re visiting the city and want to check some of them out click here to find the full program. This entry was posted in Buenos Aires Agenda and tagged Activities, argentina, buenos aires,, free concerts and events, outdoor concerts, outdoor film screenings, Parks, summer, verano by Fierro Hotel Staff. Bookmark the permalink.